Pallbearers at the border of South Sudan and Uganda carry the casket containing the remains of Duku Evans, a civilian killed November 3 amid fighting between government troops and rebels in Logo displaced persons camp in Kajo Keji, South Sudan, Nov. 5, 2017. 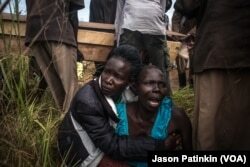 The mourners carried the casket through the tall grass along Uganda's border with war-torn South Sudan. A church choir sang graveside hymns as the deceased relatives wailed, tears streaming down their faces. Duku Evans, in his mid-30s, was killed last Friday amid clashes in the volatile Kajo Keji region, a strategic area that had been an opposition stronghold throughout the year but has seen infighting between rebels in recent weeks. He is one of the latest civilian victims of South Sudan's conflict, which has killed tens of thousands of people and shows no end in sight. As pallbearers lowered his body into a grave, his father, Moses Sokiri, held his head in his hands, shaking. Moses Sokiri, whose son Duku Evans was killed November 3 amid fighting between government troops and rebels in Logo displaced persons camp in Kajo Keji, South Sudan, weeps at his son's funeral on the Ugandan border, Nov. 5, 2017. "I feel so emotionally bad because this is my son who was always helping me in everything. Now he is dead," Sokiri told VOA after the funeral. "I really don't know what I can do. I don't know how my future will be." South Sudan's war started in 2013 as a fight between the army of President Salva Kiir, an ethnic Dinka, and his former vice president Riek Machar, a Nuer, splitting the country along ethnic lines. In the last year-and-a-half, the fighting has spread south to the country's southern Equatoria region, pitting Equatorian rebels who joined Machar against Kiir's army. The U.N. and human rights groups have accused Kiir's army of committing mass atrocities against Equatorian civilians, with dozens of people killed in Kajo Keji county alone. 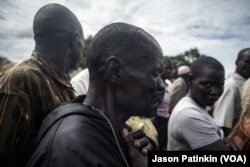 More than a million refugees have fled to Uganda to escape fighting and killings in Equatoria. Rebels are also accused of abuses. For most of this year, government forces controlled parts of Kajo Keji's east, while Machar's group, called the SPLA-IO, held the west, with thousands of civilians under their protection. The mother of Duku Evans — who was killed November 3 amid fighting between government troops and rebels in Logo displaced persons camp in Kajo Keji, South Sudan — prays with her hands out during her son's funeral on the Ugandan border, Nov. 5, 2017. But the balance of power was upended last month when a new rebel group, calling itself the National Salvation Front, entered Kajo Keji and captured the SPLA-IO's administrative headquarters at a town called Sokare. Both SPLA-IO and NAS say they want to overthrow Kiir's government, but they have different political beliefs. NAS favor autonomy for the Equatoria region, while the SPLA-IO leadership rejects this. A week after NAS entered the SPLA-IO area, government forces attacked Sokare and another town. Two civilians were killed, according to Kajo Keji's Anglican church, which tries to track civilian casualties. "We were hearing the gunshots, the heavy artillery, the RPGs, the small guns. We heard they even had the armored vehicles. My feeling was definitely I will also be killed," said Dube Sam, a 35-year-old farmer with a disabled foot who had fled to a displaced persons camp called Logo ahead of the government's arrival. Sam then left for Uganda. He said defeated SPLA-IO soldiers ran with him, urging civilians to get out. 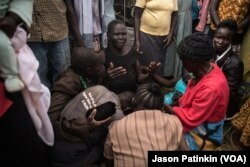 Hundreds of civilians from inside Kajo Keji amassed at the Ugandan border. The government army was unavailable for comment. 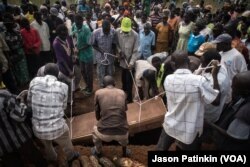 The casket containing the body of Duku Evans, who was killed November 3 amid fighting between government troops and rebels in Logo displaced persons camp in Kajo Keji, South Sudan, is lowered into a grave on the Ugandan border, Nov. 5, 2017. Sam blamed the rebel infighting for the government's advance. Community elders said that mediation attempts to get the rival rebel groups to make a deal to avoid infighting failed. "My own view is the fighting between the SPLA-IO and NAS weakened everything, and the Dinkas are actually watching them and saying let them actually finish themselves and when they don't have ammunition then we will come, and of course that is what happened," he said. NAS spokesman Yien Matthew told VOA that they did not reach an agreement with SPLA-IO because his side could not trust the rival rebel group. He also dismissed reports that civilians were affected by the fighting, claiming that anyone VOA interviewed at the border was an SPLA-IO rebel disguised as a civilian. SPLA-IO spokesman Lam Paul Gabriel accused NAS of trying to forcibly recruit from the SPLA-IO ranks. But the fighting didn't stop. On Thursday last week, fighting broke out again at Sokare. Susan Kiden, a 23-year-old mother of three, was in Logo at the time, and could hear the shooting. "I was completely afraid because I heard the gunshots and always that is dangerous, so immediately I grabbed my children and ran to the bush," she said. The next day, only a handful of civilians remained in Logo, including a local elder and chief, Matatia Abang Roka. That's when, he says, the government forces attacked the camp. "The Dinka came in the morning around 7 o'clock. They started shooting at the camp then immediately we took off because we thought they were going to kill us," he said. The sister of Duku Evans — who was killed November 3 amid fighting between government troops and rebels in Logo displaced persons camp in Kajo Keji, South Sudan — wails as the casket containing her brother's body is carried by at his funeral on the Ugandan border, Nov. 5, 2017. It was sometime in this fight that Duku Evans was killed, though it is unclear who was at fault. Sokiri, the father, said he found his son's body dumped in a pit latrine in Logo camp on Saturday. By then, the government had pulled out and the SPLA-IO was in control of the camp. "I found him when he's dead and personally I couldn't point the finger that he is either killed by the SPLA-IO or the government," he said. "The government forces came in the morning, and my son was killed in the afternoon hours." But he blamed NAS for the rebel split. "Actually, we strongly feel that [the SPLA-IO] were protecting us," he said. "We thought that the arrival of NAS paralyzed everything. As soon as they came in they were not fighting [in the government barracks], they were fighting among the civilians, and people got scared and ran." Now, hundreds of civilians are camped at the border, unsure of what to do next. "We are stuck," said Kiden. "If we go to the refugee camps in Uganda, the life is full of suffering, the food isn't given out on time, but if I decide to go back to South Sudan, I will be forced to run away from death."